PEPLUM TV: Article of the week : Twin productions! In this article, I'll go over what I call 'Twin productions' as they are movies that are identical in many ways, often utilizing the same cast, or the same crew, or the same sets, sometimes costumes, music but with a totally different story and / or setting. These are not sequels or part of a series. The stories are different even if the rest is pretty much the same. Some of these films were shot back to back but many of them were shot at the same time. Some actors have stated that they worked on two different productions at the same time which confused them, certainly with the language barrier. Since there are even more titles than those listed here, this is part 1. Twin productions both starring Lang Jeffries and released at the end of the PEPLUM craze. Both films were produced by Giorgio Marzelli. Some big sets and costumes can be seen in both productions. The supporting cast are different, as are the directors but both films feel and look the same. 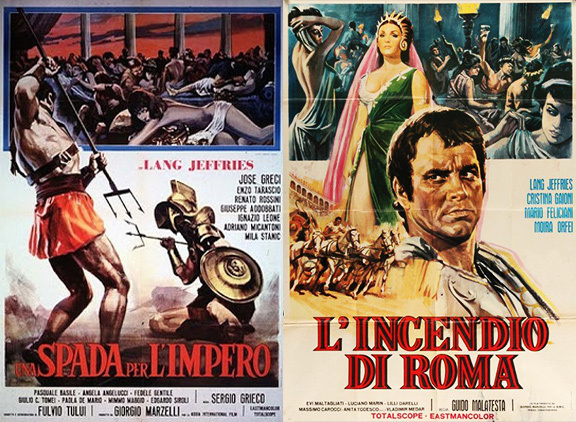 SWORD OF THE EMPIRE was released first even though it included scenes from the soon to be released FIRE OVER ROME (this is not the first time this has happened)! Both films are difficult to come by. I recently uploaded a Fan Dub of FIRE OVER ROME at PEPLUM TV channel and I recently got hold of the ever elusive English version of SWORD OF THE EMPIRE, which I need to do a watchable Fan Dub with it. Though very similar, both movies are easy to differentiate from each other. One of the few set of 'Twin productions' that's radically different except for sets, costumes and music. The rest are totally different: different directors, different cast. Sergio Spina is credited for both stories but even the screenwriters are different. But if you watch them back to back, you'd swear they were the same films since they used the same sets and costumes. There is a 'trompe-l'oeil' effect going on with these two titles. Top image below is from WAR GODS OF BABYLON and the other is from SLAVE QUEEN OF BABYLON. Steve Reeves was set to star in THE WONDERS OF ALADDIN after making THIEF OF BAGHDAD but last minute changes were made and Donald O'Connor was used instead. Both films were co-produced by TITANUS and LUX Film, a French production company. 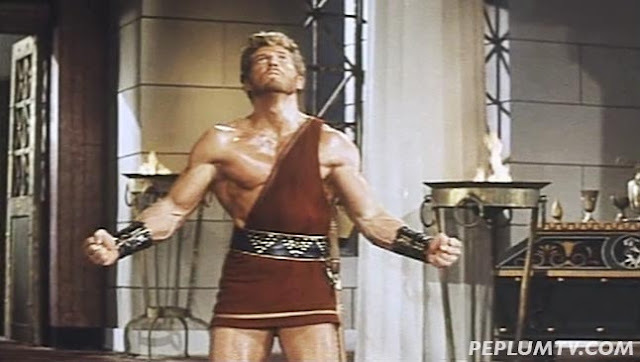 How does one go from Steve Reeves to Donald O'Connor? 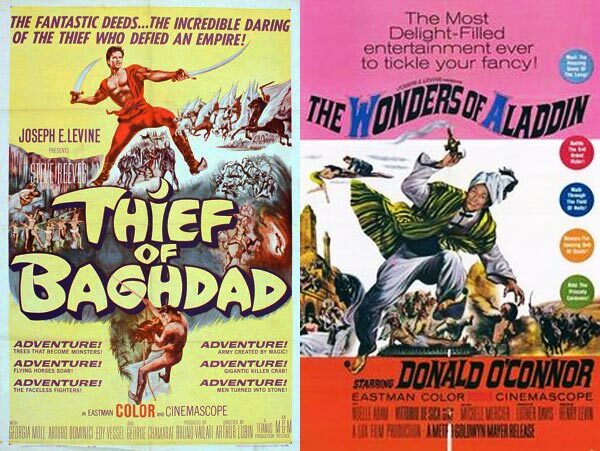 Both films were released the same year but THIEF OF BAGHDAD was released earlier in the year. Though the productions do look alike, for me it's almost impossible to confuse these titles with each other: one has Steve Reeves, the other doesn't. These two Tony Russell movies were directed by Alberto De Martino, almost the same cast with Russel co-starring with Helga Liné, Livio Lorenzon, Massimo Serato, etc. Same writers, same sets, same locations. 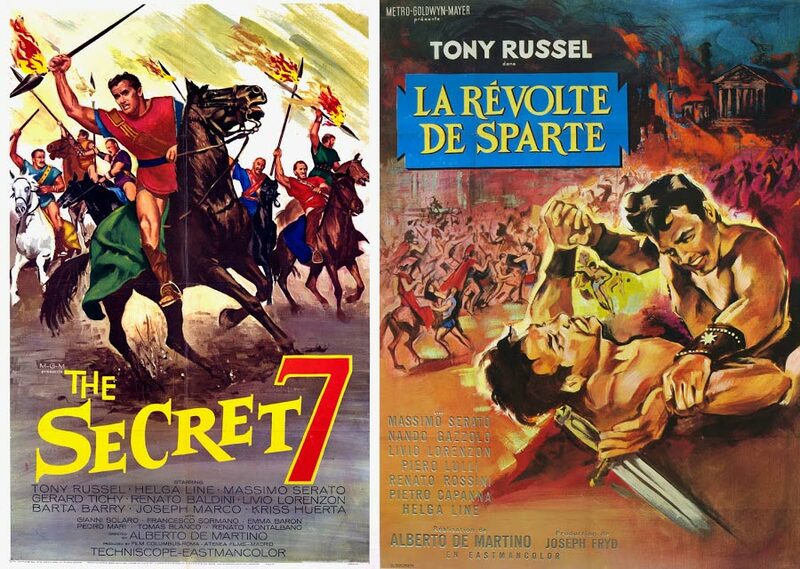 It's easy for me to figure out the difference between these two films: SPARTAN is more colourful and has more sets while SECRET SEVEN is mostly shot outside. Also, some actors, like Pietro Capana and Howard Ross are in SPARTAN GLADIATORS and not in SECRET SEVEN. Even if they are alike, these two movies don't confuse me. 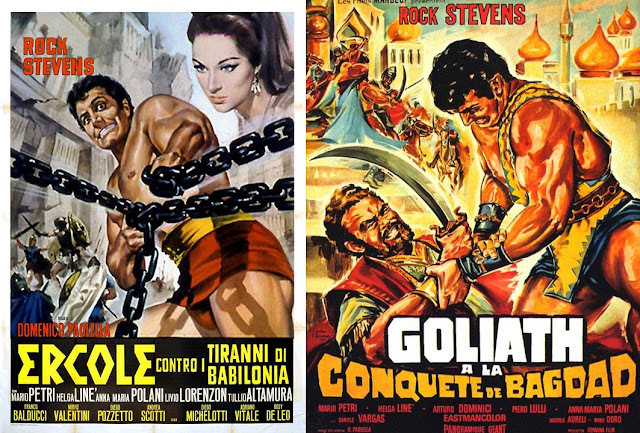 Both of these Peter Lupus movies used scenes from SODOM & GOMORRAH (1962). There is some major confusion in regards to both of them. Both were directed by Domenico Paolella. Same lead cast, same sets, same locations. The only way for me to truly set them apart is Pietro Torrisi's role in GOLIATH is much bigger and he's a 'good' guy. Also, in TYRANTS, there the destruction of Babylon (with destruction scenes from the SODOM movie). Though I like both films, I personally prefer HERCULES AGAINST THE TYRANTS. Their similarities don't automatically translate into both being good on the same level. These two Brad Harris movies couldn't look more alike. Major confusion with these 'Twin productions.' The only thing that really sets them apart is the fact that SAMSON is so much better than FURY OF HERCULES. The other thing which set both movies apart is Alan Steel's role is less important in FURY. But aside from these discrepancies, both films are virtually identical. Same cast, same director, same sets, same costumes, including Brad Harris' muscle tunic, almost same 'Feats of strength.' Personally speaking it would have been much better if they just had made a sequel to the superior SAMSON instead of making it a Hercules film in name only. 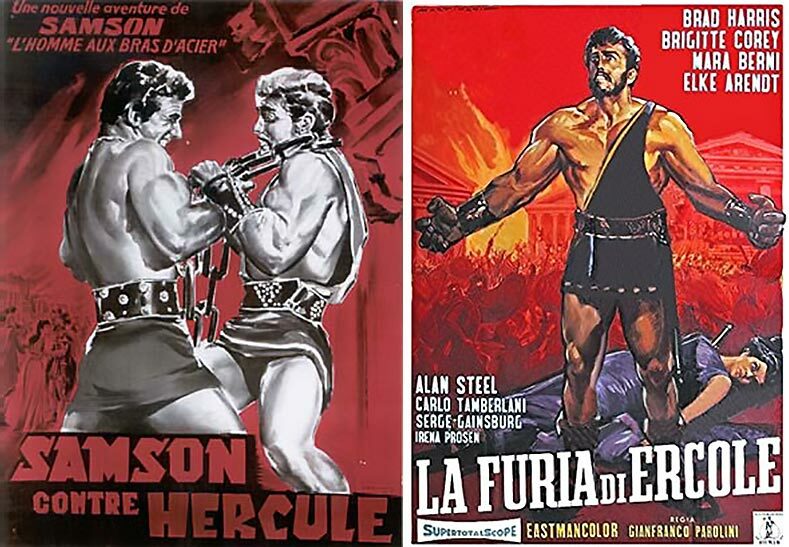 To make matters even worse, German distributors switched the titles : what was initially SAMSON became HERCULES and what was FURY OF HERCULES became SAMSON. Why? I don't know. Above: Brad in SAMSON. Below: Brad in FURY OF HERCULES. See the difference? Me neither. The best 'Twin productions' listed here. These films utilized footage from THE MONGOLS (1960) and were most likely conceived with this in mind. 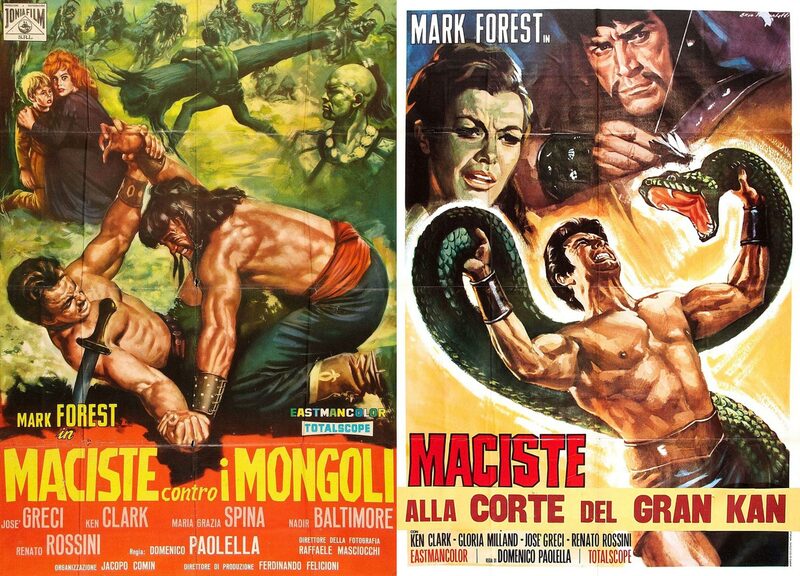 Mark Forest played Maciste (renamed Hercules for US market). HERCULES AGAINST THE MONGOLS was made and released first. Both films were directed by Domenico Paolella and the cast are virtually identical with the exception being that Nadir Moretti and Maria Grazia Spina star in MONGOLS only, while Gloria Milland stars in BARBARIANS only. But identical as they are, they couldn't be more different: HERCULES AGAINST THE MONGOLS is a fast paced, straight forward action film while HERCULES AGAINST THE BARBARIANS is more like a moody, dark romantic fairy tale, with evil lurking at every corner. I hope you enjoyed this Article of the week. There'll be more such articles this year. There should also be a part 2 of this 'Twin productions' topic in the near future. Note : I created a new 'permanent page' where all 'Articles of the week' for 2018 will be posted. Thank you for this article. In fact I would rather watch any of these twin productions again than watch Hercules against Moloch or Hercules the Avenger (due to their excess usage of footage from other films). I wouldn't necessarily consider SAPPHO and SIEGE OF SYRACUSE as 'Twin Productions' even though both films star Tina Louise and directed by Pietro Francisci. SAPPHO was produced by Columbia pictures and SIEGE by Paramount. Very little from one film ended up in the other film (costumes, sets). The only similarities are director, female star and composer (Lavagnino) and longtime Francisci screenwriter, Ennio de Concini. It's sorta in a grey area. But SIEGE OF SYRACUSE is a twin production with another film. Can you guess it? I just watched SPARTAN GLADIATORS, and noticed that most of the cast was the same. I liked this movie very much, and I thought it was more of a sequel. I also agree with that SAMSON is much better then FURY OF HERCULES, especially since I have pristine dvd of SAMSON while FURY OF HERCULES is a washed out copy. Esther and the King which is essentially a 20th Century-Fox movie produced in Italy. When WARRIOR EMPRESS had a press conference announcing the start o the film, with Tina Louise and Kerwin Matthews present along with Pietro Francisci, Columbia was already signed to distribute it. Kerwin had success with THE 7TH VOYAGES OF SINBAD, a Columbia film. Hollywood studios didn't finance the movies but by guaranteeing US distribution, financing for these projects was easy and the reason the budgets of these films were higher than previous productions. 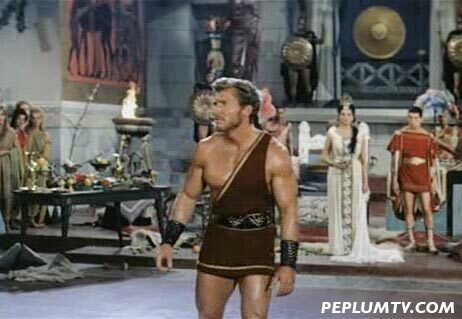 This included HERCULES, SAMSON and ULYSSES for MGM. 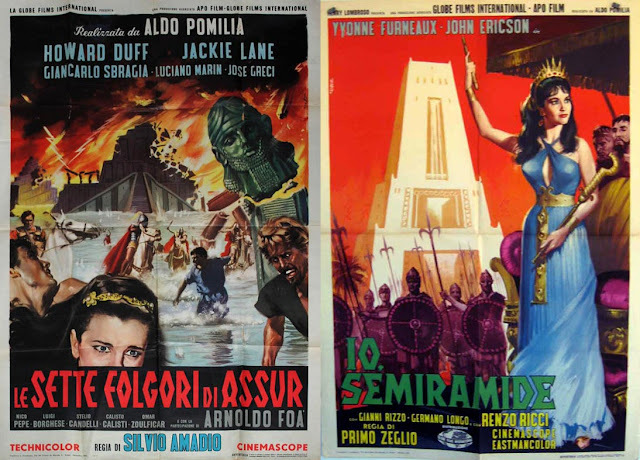 Francisci's WARRIOR EMPRESS, SIEGE OF SYRACUSE and HERCULES, SAMSON & ULYSSES weren't made just like that then sold to US studios after they were completed. They were made with the advance knowledge that these films would be guaranteed US distribution by these specific Hollywood studios. So yes they had some backing from Hollywood, unlike HERCULES which was done without any backing and its US distribution rights purchased by Levine after HERCULES was completed. The MGM movies had an Italian unit headed by producer Joseph Fryd and, yes, MGM money was put into those movies. It wasn't the same with Columbia. Kerwin Mathews was in Europe making Three Worlds of Gulliver and Columbia agreed to loan him to the company making Warrior Empress in exchange for the U.S. distribution rights. Mathews told me this himself. British Hammer studios also did some twin productions to save money, most notably (I think) Dracula, Prince of Darkness and Rasputin, the Mad Monk. 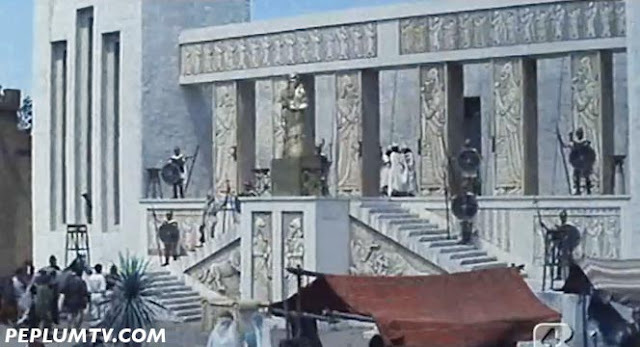 The sets and parts of the cast are identical, and to my amusement, the set of Dracula's castle / the royal Palace also appeared in an episode of The Persuaders, starring peplum stars Tony Curtis and Roger Moore. My first thought that went into my head when I saw that was "That's Dracula's castle!" Richard, yes, Hammer is comparable to PEPLUM films.